Besides an entire human anatomy model, what options do I have for talking to patients about all the various organs affected by hypertension? There are many physicians who have full human anatomy models in their main office or in an examination room. However, there are definite drawbacks to a full size model that takes up a huge corner of your available room space. A better option is to consider a hypertension model that shows just the affected organs and body parts. By narrowing down the model and avoiding a lot of extra information, the patient is able to focus more on the essentials without distraction. Another reason that a specific model is beneficial is that the study card behind the model is a great way to ensure that you have provided information to the patient on all the complications caused by the health condition. If you don't use the model you may omit or skip over various health risks as the conversation with the patient gets a bit off track. The card just helps to keep everything logical and comprehensive without appearing to be a classroom lecture. Is there a hypertension model available that is suitable for self-study in a laboratory or classroom environment? A hypertension model that has a miniature model of each of the organs and body systems associated with the disease is a great self-study tool in a classroom or laboratory. These models will provide summary information of the effects of hypertension on the depicted body parts. With diagrams as well as 3D versions of the organs learning actually comes to life. Students can use the model in a variety of ways from preparing for tests and exams through to anatomy review and gaining a better understanding of the results of hypertension. 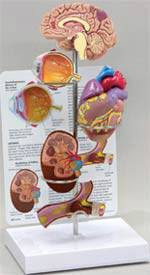 This model can be supplemented with full size organ models showing both diseased and healthy organs. With a range of models comparisons can be made very easily and quickly and highlight the damage the disease causes. What is the typical size and shape of a hypertension model? With the organ components of the model approximately half of the size of the individual organ models, the size of this display is actually very small and compact. The entire stand is about thirteen and one half inches tall. The card on the back of the model that contains a wealth of additional information and graphics is six and one quarter inches by eight and one quarter inches in size. The entire model and card stand on a base that is six and one half inches by five inches. Should I choose a hypertension model or a chart for my examination rooms in a smaller clinic? Both a hypertension model as well as a chart are good space saving options for a small office or examination room. The major advantage of the model is that it is three dimensional and typically much more patient friendly than a basic or advanced type of anatomy chart or hypertension poster.